Some friends and I have been searching for a good boozy brunch spot in the Capital Region. Recommendations on a stellar bloody mary or mimosa? Are there any places in the area that offer the elusive bottomless booze brunch special? It's so popular down in the city - but hasn't seemed to make its way to Albany yet. PS - We're not lushes. I swear. 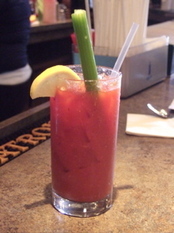 We (and many others) have enjoyed a few Bloody Marys at Cafe Madison. Any suggestions for Cait and her friends? Please share! It's not all you can drink, but the new brunch drink menu at New World is amazing (http://newworldbistrobar.com/brunch/) and Sarah Jane is always happy to experiment and make something delicious for you. I'm partial to the tomato-tini. Creo in Stuyvesant plaza has a delicious brunch menu on Sundays, and I hear the mimosa's are superb (I'm more of a Bailey's and coffee type myself). Justin's, Wolff's, Franklin's Tower and Marche all have great boozy brunches. Side note- Marche USED to offer bottomless mimosas or bloody marys, but I think they discontinued it. Oh, I nearly forgot Iron Gate Cafe. They're great too. But seriously, the best Bloody Marys in the region belong to Justin's. That's just MHO. I'm going to have to go with Wolff's Biergarten on this one. They're open at 9am on the weekend. True they only have beer and some wine. But those high alcohol beer's will get you where you're going. And you can be as loud and as messy as you want and nobody will bat an eye. Plus the food is great. What more could you ask for? Oh yeah.. free beer on your birthday! Second vote for Creo. Good Bloody Marys. Not Bottomless though. Get the Duck Hash or Smoked Salmon platter for brunch. Creo has the best Bloody's - No question! Quintessence does a great Sunday brunch! Full bar. Another vote for Creo...I dream of those Bloody Marys. Any boozy brunches in the Saratoga-ish area? Max London's in Saratoga has a really good brunch menu, was tempted to get a drink but opted out. Wolff's is the hangover breakfast to end all hangover breakfasts. Get the breakfast wurst plate. It comes with fantastic German sausage, scrambled eggs (though I usually get them over easy), potato pancakes, and coffee. A half-liter of Warsteiner Dunkel and I'm ready for a nap. Just found out that the Gideon Putnam has a brunch buffett. Brunch with Unlimited Bloody Mary's or Mimosa's $29.95!!!! My personal favorite is Iron Gate Cafe on Washington. Adorable setting with a fabulous brunch menu. Their weekend specials lists are always appetizing too! This is one place my roommate and I love end our weekends here with Sunday brunch having mimosas or poinsettias! The Stockade Inn in Sch'dy has a strong showing. The Inn's evening atmosphere bleeds into brunch service so its a little less laid back than I prefer. We went to the Capital City Gastropub for Mother's Day, and we loved it. New World! Blood Orange Mimosas,Breakfast Bowl, Incredible waffles! Hattie's in Saratoga has a great boozy brunch. Their mint juleps are delicious, strong, and served in authentic julep cups! I recommend the chicken and waffles. City Beer Hall, Free cocktail and coffee or juice with every entree. And there's a patio! Another vote for city beer hall. Can't beat the brunch deal, and the food is tasty.